You’ll thank yourself very much if you make a batch of this gloriously green sauce ASAP. YOU HAVEN’T FORGOTTEN about pesto, have you? This is a public service announcement. I made pasta with pesto for guests recently, and they loved it. As in, could not stop talking about how good it was while they ate it as fast as they could and then asked for more. The happiness-to-effort ratio was approximately 1,000,000 to 1. I felt like I tied my shoes successfully and was given a Nobel Prize. Then I made some pesto the other afternoon — it takes about 10 minutes — and boiled some noodles at 9 p.m., then ate pesto pasta while watching “Glow.” I kept thinking, “This is so good” (the pesto pasta, though the new season of “Glow” is good, too, especially episode 8). Happiness-to-effort ratio: also off the charts. Pesto is simple, pure green gloriousness. 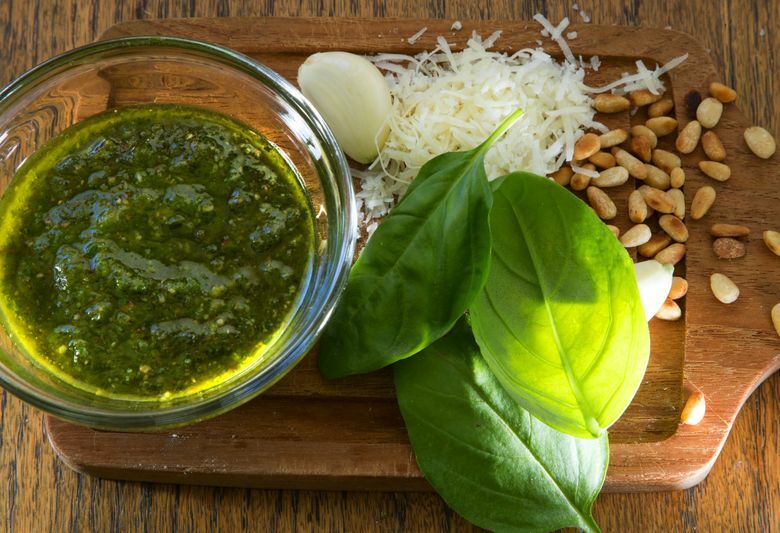 The taste of this magic sauce combines the peppery freshness of basil, the tingle of raw garlic, the luxuriousness of olive oil, the savory-umami of Parmesan and the earthiness of pine nuts. Pesto may, of course, be messed with — parsley instead of basil, or substitute hazelnuts or almonds, or try a goat-cheese or ricotta version — but the classic version is classic for a reason. It’s light but rich, bright but smooth, verdant and lush. Pesto pasta is perfect. Goddess of Italian cooking Marcella Hazan, never wanting for an authoritative proclamation, said that pesto has “just one great role: to be the most seductive of all sauces for pasta.” The truest version, served in pesto’s hometown of Genoa, has potatoes and green beans in it. This might mark me as a philistine, but I had it there once, and the romance of the tiny restaurant off the winding cobblestone road did not dispel the nagging question of why my fettuccine had potatoes in it. Pasta with pesto — just pesto — is perfect. Marcella, rest her opinionated soul, surely would’ve disapproved, but leftover cold pesto pasta — or, more elaborately, pesto pasta salad — is also good. You can find a recipe-hack for Seattle’s secret favorite pasta salad online by Googling “Pagliacci pesto pasta salad.” Created after the pizza chain opened its first spot in the University District, it’s a vestige of the 1980s — when pesto achieved popularity in the United States, before stupidly falling out of favor. (The U-District Pagliacci outlet also, stupidly, just closed. RIP.) It’s also stupid-simple: Make pesto pasta, add peas and artichoke hearts, then a creamy element for a little old-school macaroni-salad flair — the people at Pagliacci tell me they use heavy cream, but a couple spoonfuls of mayonnaise seems like a completely defensible choice. Chill and eat (with Netflix, if you like). You can also make your own pizza with pesto standing in for the sauce (very thin slices of potato are great on top). Stirring pesto in at the end of scrambled eggs is lovely. (Green eggs, finally! Ham is optional.) Putting pesto inside a grilled cheese or quesadilla improves life in a small but significant way. 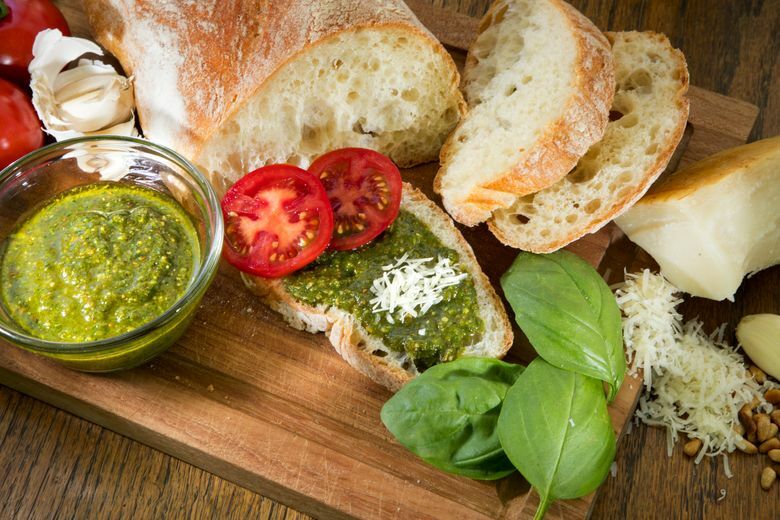 Pesto is a natural for a fancy-toast topping. And it’s miraculous spread on a piece of nice bread with fresh mozzarella and slices of height-of-summer tomato. Speaking of summer: Now is the time to make pesto, while big bunches of basil may be found in picturesque, fragrant heaps at the farmers market. More prosaically, Trader Joe’s sells foot-tall basil plants for $3.49; keep one on your kitchen windowsill, and you’ll get several batches of pesto out of it (and find yourself pinching off leaves to throw in salads, for little caprese snacks and so forth … more small-but-significant life improvements). You can also make extra pesto, put it in a container, drizzle a thin layer of additional olive oil on top and freeze it for later. Your November self will thank you. The Italian for “pound” or “grind” is pestare, and pestle is pestello. If you want to connect with your inner old-timey person, you can absolutely make pesto with a mortar and pestle, but even Marcella Hazan admitted that it’s better to make it with a modern appliance than not to make it at all. She’d be a stickler for Parmigiano-Reggiano, too, and certainly nicer-quality parm is best — but if you’re not made of money, you should not be deprived of pesto. Just don’t use those pregrated pellets (or the weird dust-granules from the green can!). If you’re making pasta with pesto, grate some extra parm for sprinkling over the top, and save a few pine nuts for that, too, and maybe a few cute, small basil leaves. 1. In a dry pan over medium heat, toast the pine nuts, stirring every couple minutes; keep an eye on them, as they’ll go suddenly from toasty to burned (toasty should happen between 5 and 10 minutes). 2. Cut the hard nub end off the garlic clove, and smash it with the flat side of your knife; the skin should come right off (discard it). 3. Put basil, garlic, pine nuts, olive oil and about ½ teaspoon of salt in your blender, food processor or immersion-blender cup. (The immersion-blender method is the easiest to clean up after.) Blend until smooth — or leave it a little chunky, if you like — then add the Parmesan, and blend again briefly to mix. Mike Siegel is a Times staff photographer.